Lightly grease a loaf pan. Beat the eggs and sugar until very smooth and increased in volume, about 7-8 minutes. The egg and sugar mixture will double in volume and turn very pale yellow, leaving ribbons on top of the batter when you lift the beaters. 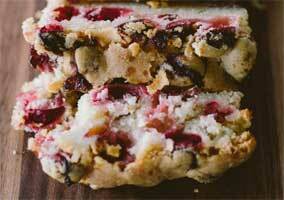 Use a spatula to fold in the flour, salt, cranberries and nuts. The batter will be quite thick. Spread gently into the prepared pan. Bake 55-60 minutes. Tent the cake with foil in the last 30 minutes of baking to keep the top from browning. The cake keeps and freezes well. To store, wrap the fully cooled cake tightly in plastic wrap and leave in a dry, cool place for up to 1 week. To freeze, wrap the fully cooled cake in plastic wrap and then foil. Freeze for up to 2 months. Thaw overnight at room temperature, still wrapped.